If you have the perfect design idea for personalized napkins for your party, wedding reception or anniversary gala, you can design your own napkins right here! The Knot Shop, your wedding specialists, give you the tools to design your own paper napkins with a word, name or initial that holds special significance. 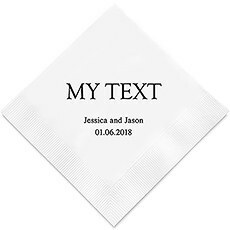 You can then add up to two lines of customizable text, such as the couples' first names and wedding date or person's name and birthdate.Available sizes of our personalized napkins include cocktail/beverage, luncheon and dinner napkins. You choose the desired napkin color from several vibrant selections like red, purple, hot pink, silver gray and coral. Select an imprint foil color that provides good contrast for a beautiful presentation. We offer metallic gold, metallic silver, metallic fuchsia, metallic rainbow and several more. You can even try out different color combinations and design ideas, previewing each one until you find the best customized napkin for your event. Coordinate colors to match your table decor for a look that people will think was created by a professional designer!With our design your own napkins, you can let your creativity run wild. Your chosen word can be up to 7 characters. What 7 letters describe your union? Is it Love, Peace, Harmony or something else? Your personal touch on these affordable custom napkins will be a lovely memento for all your guests to take home with them and add to a photo scrapbook of the occasion.The Knot Shop honors every individual, giving you the tools you need to create unique, beautiful settings for weddings, anniversaries, birthdays, engagement parties, bridal showers and other special occasions.